In a frying pan heat the olive oil and saute the onion. When the onion is soft, add the garlic and fresh chilli and cook for a few minutes. Add the beef cubes, brown for a few minutes then add the mushrooms and season with black pepper, salt and dried rosemary. Once the beef is cooked, add the cream. 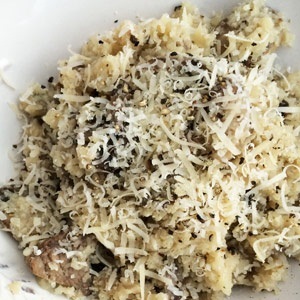 In a food processor or using a grater, blend/grate your cauliflower into medium to fine pieces of 'rice'. Empty the mushroom/beef mix into a separate dish, without cleaning the pan, turn up the heat and add the cauliflower rice into the pan. Fry the cauliflower for about 1 and a half minutes. Start adding the chicken stock about 1/4 cup at a time, stirring all the constantly. The stock needs to reduce before adding the next 1/4 cup so make sure your pan is on the correct heat. As soon as all the stock has been reduced add the mushroom and beef mix back into the pan. Turn heat on low and allow risotto to simmer until it becomes sticky and delicious. Serve with black pepper and Parmesan shavings.